Federal Government Employees Housing Foundation (FGEHF) was established as a cell in Ministry of Housing & Works in 1989 and on 26th March 1990 it was registered as a guarantee limited company with Securities & Exchange Commission of Pakistan under section 42 of Companies Ordinance 1984. 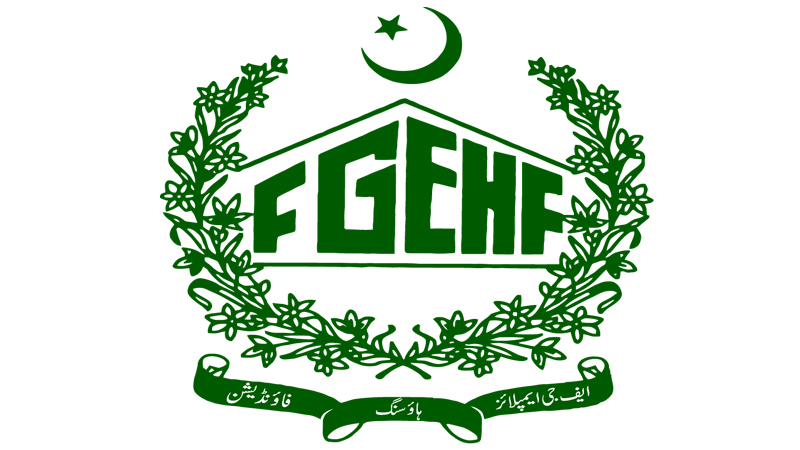 Purpose of FGEHF is to initiate, launch, sponsor and implement housing schemes for Federal Government Employees on ownership basis in all major cities of Pakistan to eradicate homelessness in Federal Government Employees and to make and assist as far as possible each of them to have a house at the time of retirement or earlier. FGE Housing Foundation allotted 22642 number of units to its members from 1989 to 2013 (19458 plots, 1595 houses & 1589 apartments) in Islamabad, Peshawar, and Karachi. Whereas from 2014 to 2018 FGE Housing Foundation planned/allotted 26795 number of units (23833 plots & 2962 apartments) to its registered members under Membership Drive Phase-I (Aug-2009 to Feb-2014) and Membership Drive Phase-II (Apr-2015 to Sep-2018) in various housing schemes in Islamabad in various ongoing schemes. In 1996, PM Special Allocation of plots in Sectors E-12, D-12, I-8, G-11 & G-10 was extended. CDA placed 481 plots at the disposal of FGEHF for allotment. The allotments were made on the recommendation of P.M Office. The housing Scheme Phase-I SECTOR (I-8, G-11) Islamabad of the Housing Foundation was launched in 1989 for allotment of plots to FG Employees. CDA had placed the plots at the disposal of FGEHF and development work of the Sector is the responsibility of CDA. The housing Scheme Phase-II of the Housing Foundation was launched in 1992 in SECTOR (E-12, D-12) Islamabad for allotment of plots to FG Employees and CDA had placed these plots at the disposal of FGEHF and development work of the Sector is the responsibility of CDA. The Housing Scheme Phase-III of the Housing Foundation was launched in 1996 in sector G-13, G-14/4 Islamabad. The sector was acquired through the Land Acquisition Collector (LAC) under LAC act 1894. Initial development was awarded by CDA to FWO. As per PC-I approved at that time, the maintenance work of the said sector was to be carried out by CDA. Later on, in March 2015, in compliance of Wafaqi Mohtasib findings, all Infrastructure development work and maintenance work is being carried out by Housing Foundation. The housing Scheme Phase-IV was launched in 2004 in sector G-14/1,2,3 Islamabad. The development work of sub Sector G-14/1,2,3 was awarded in 2012. In sector G-14/1 Survey of BUPs in going on and shall be completed in the near future. The housing Scheme Phase-V (Apartment Scheme) was launched in 2005 in sector G-11/3&4 Islamabad. It was the first project of the Housing Foundation for allotment of 1000 apartment to FG Employee in Sector G-11/3, G-11/4 Islamabad. The allotment was made on the basis of open balloting in 2006. The Membership Drive, Phase-I of the Housing Foundation was started for FG Employees & others in 2009 on the basis of ‘FIRST COMES FIRST SERVE’. The process of issuance of Consent letter was commenced in April 2015. The housing Scheme PHASE VII (F-14/15) of the Housing foundation was commenced in 2015 after getting formal approval from Prime Minister of Pakistan on 1st May 2015. Registered members of Phase-II Membership Drive are eligible for allotment under this scheme on age wise seniority. Federal Government Employees Housing Foundation under auspices of Ministry of Housing and Works has initiated a pilot project of high rise apartment scheme for Federal Government employees and other specified groups on land owned by FGEHF in sector G-13 /1&4, Islamabad. Total plot size of the project is 15.37 acres, in which 10.10 acres is located at G-13/1 and remaining 5.27 acres is located in G-13/4. FGEHF has planned to launch this scheme through Joint Venture of public-private partnership for construction of Ground +14 storey high-rise 2962 apartments with Three basements for Federal Government Employees for all categories in which 75% of total apartments are allocated to Federal Government Employees. EHFPRO is a private limited company registered under Companies Ordinance, 1984 with the Security and Exchange Commission of Pakistan (SECP). It is a dynamic Special Purpose Vehicle (SPV) formed under joint collaboration of Federal Government Employees Housing Foundation (FGEHF) and M/s Progressive Motels & Resorts. Its formation is specific to the development of Lifestyle Residency Project at G-13/1&4 and offers an ideal combination of expertise both from the Private and the Public Sector. EHFPRO is a formidable initiative of dedicated professionals infused with the vigor to ensure completion of the project within the specified time ensuring the best quality of work. In moving further with the Prime Minister’s vision to provide housing to Government Employees and General Public, EHFPRO introduces “LIFESTYLE Residency” project, providing a safe, secure and enclosed environment for residents in Capital city. Lifestyle Residency is an opportunity to get a luxury apartment in a secure and serene environment of Islamabad Capital Territory. The project offers facilities that cater to contemporary needs of urban living i.e. Lush Green Parks, Generators as backup for Elevators, Community Club, Mini Supermarket, Security System, Auditorium, Day Care Centre for Toddlers, Gymnasium for Fitness, Beauty Salon, Banquet Facilities, Grocery Store along with Maintenance and Garbage Disposal Services. Lifestyle Residency promises to be a project aimed at provision of such modern amenities at affordable prices. With optimized utilization of space, the concept of community living is being encouraged as is the case in major cosmopolitan centers of the world. As per planning of the project, 2962 apartments will be constructed on an area measuring more than 15 acres out of which 75% apartments will be allotted to the Federal Government Employees whereas 25% shall be allotted to General Public. Lifestyle Residency is located at the gateway to Islamabad in the newly developed Sector G-13, Islamabad. It is nearly 13 Kms from the New Islamabad International Airport within close proximity of the Motorway and offers easy access from Kashmir Highway through a 4 lane metalled /carpeted road running 500 meters. The location of the luxury apartments is ideal not only for those in Islamabad but also for those who reside in its twin city, Rawalpindi. The housing Scheme PHASE IX (Thalian Housing Scheme) of the Housing Foundation was launched in 2017 through joint Venture policy for land banking in collaboration with the private sector and was approved by the Federal Cabinet. So far only Consent Letters have been issued to about 5317 registered members of Phase-II Membership Drive year 2015-2016. The matter of launching of PHASE IX (Thalian Housing Scheme) was taken up by the Public Accounts Committee (PAC) of the Federal, but the matter is still pending in PAC. The housing Scheme PHASE X (Park Road Housing Scheme) of the Housing foundation in village Tamma and Moriyan was initiated in the pursuance to the order of the Honorable Supreme Court of Pakistan dated 29-04-2015 and 13-04-2015. The said land was to be acquired on a parity basis 50% each for SCBAP & FG Employee. In this regard Land Acquisition Collector (LAC) Islamabad has announced notification under section-II of Land Acquisition act 1984 for the acquisition of 8106 Kanal of land. Acquisition processes in progress and consent letter, POL to FG Employees & SCBAP members have been issued.